I've finally gotten my hands on the Revlon Lip Butter that perhaps every youtube beauty guru and beauty blogger has been raving about. I was intrigued by all the hype that this has been making so I was continuously on the hunt for this. This item has been selling out at my local Rite Aid for a couple of weeks now and they finally have this one on stock and it's already nearly gone again. There were only five shades left and I decided to just get one because I'm not so sure about this product and I hate wasting money on products I don't like. I'm not really the one who likes returning items either except if it really doesn't work for me. Anyway, I purchased the shade Cherry Tart. It is a cherry red in color. 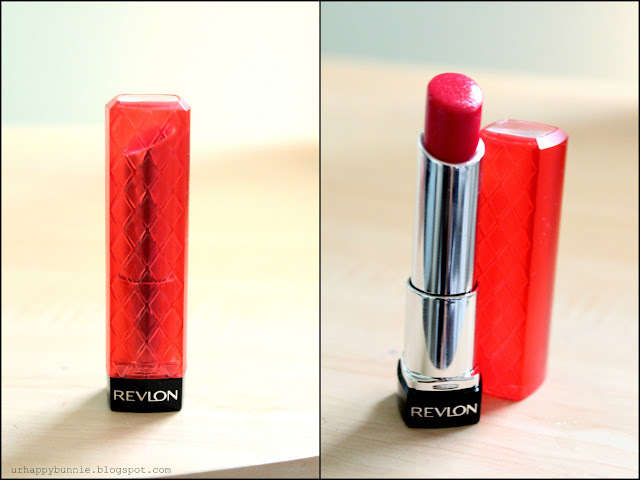 This Revlon Lip Butter is very moisturizing and very nice smooth application. It is pigmented and one swipe from it can give you a nice stain but it is also buildable and a couple more swipes appear to look like a freshly glossed lip. I'm not sure if this is true to all the Revlon Lip Butters but this Cherry Tart has shimmers. When I swatched it on my hand I noticed a very faint vanilla smell that is reminiscent of the MAC lipsticks. This product does stay true to its name: lip butter. It is indeed very moisturizing and has a rich color that is very ideal for the winter season. However, personally I'm not really ecstatic about this product when I tried this. I don't know why but it seems that it doesn't live up to the reviews and raves of beauty bloggers around the world; I feel like there is something missing about it for me. Maybe I just expected too much from this product that I feel that it is a lacking at some point. This is really a great product but it is just not for me. I'm willing to give this product a chance though and I might be purchasing another one just to see if maybe it was just the shade that I'm not so happy about. I'll give this a rating of 8/10, ticking off two points just for that personal reason. I've been Looking for these also and the last store I went to had a 3 left. Colors I didn't like and 1 I wanted but someone dug their finger in it. that's too bad. i'm kinda disappointed with this product though but it is still a good one.